June 2015 – Interested in Learning How to Find, Select and Eventually Live On Board Your Own Sailboat? You're in the Right Place…. As I mentioned in my earlier post, we had decided to spend the Memorial Day Weekend in St. Augustine to avoid the increased boat traffic. That turned out to be a great decision. The powerboat traffic, at least in the area of St. Augustine was relentless from sunrise to sunset. We were able to sit back, relax, dinghy into town for sightseeing and great food, with no added stress from navigating the flotilla of powerboats. 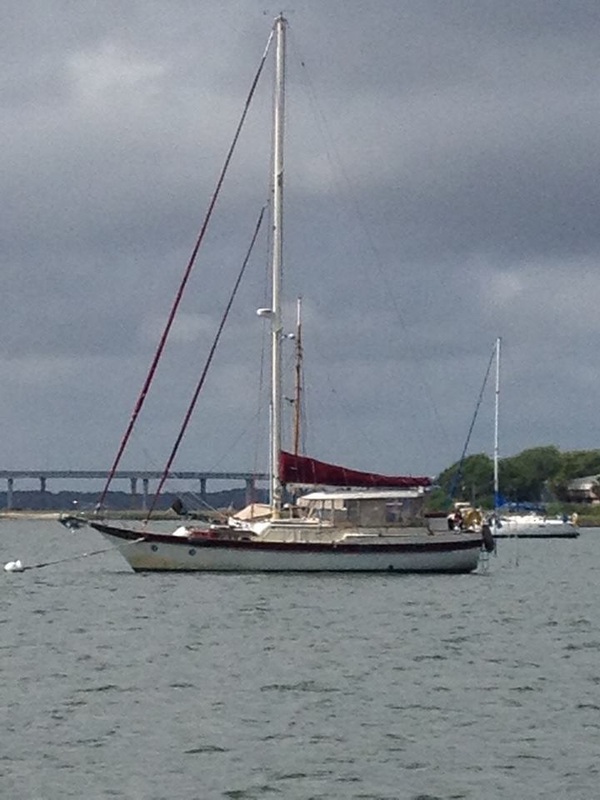 While we were in the mooring field, we met another CSY owner…Dave, a singlehander, on Windswept…(a CSY walthru model). Talk about the small world theory…Dave was friends with another member of the CSY Owner’s group, Peter, with whom he had recently visited. Dave wasn’t a member of the owner’s group but had heard about a project to get a re-creation of the bronze CSY “badges” manufactured. 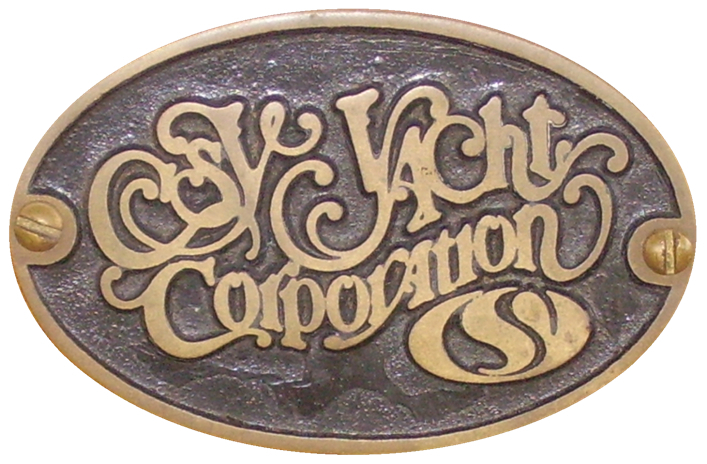 These badges originally adorned the forward companionway hatches on all CSY’s but over the decades were removed as souvenirs by owners who were selling their boats or lost during refits. 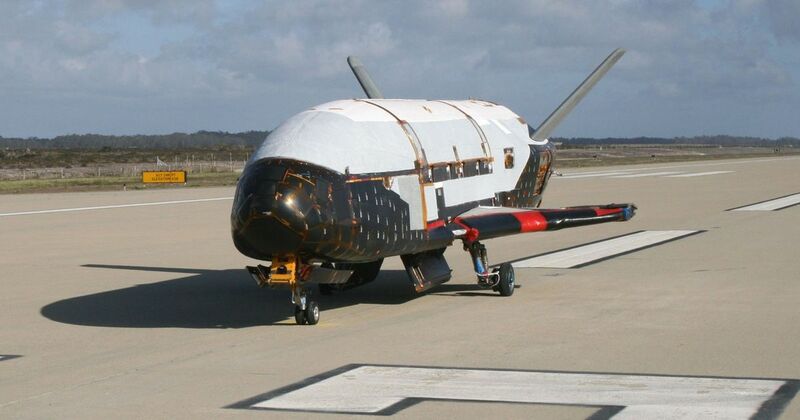 I asked Dave if he had been able to get one of these and he said that Peter had sent him some information about them but he hadn’t had time to follow up. Dave wasn’t aware that I was the member who had the badges made for the owner’s group. I happened to have a couple of spare badges so I gave one to Dave. He was very surprised and appreciative. 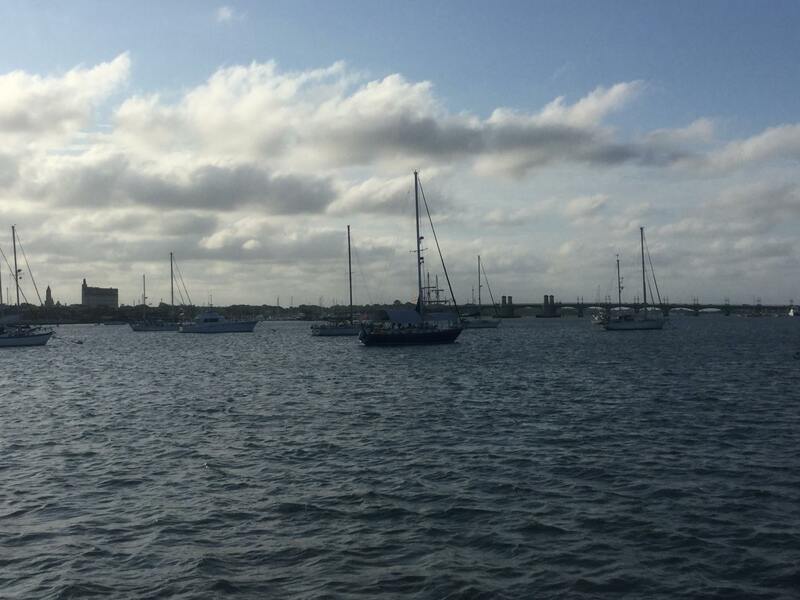 We departed St. Augustine at around 7am on Tuesday, May 26th and made a timely pass through the Bridge of Lions. This was a good thing because the bridge doesn’t open for rush hour and we would have had to wait until 8:30am to depart. We had a long (About 9 hours) but uneventful day trip to Fernandina Beach where we docked at the Fernandina Harbor Marina, topped off our diesel tanks and settled in for the night. We had a great meal at the Salty Pelican Bar and Grill and then walked the downtown area. 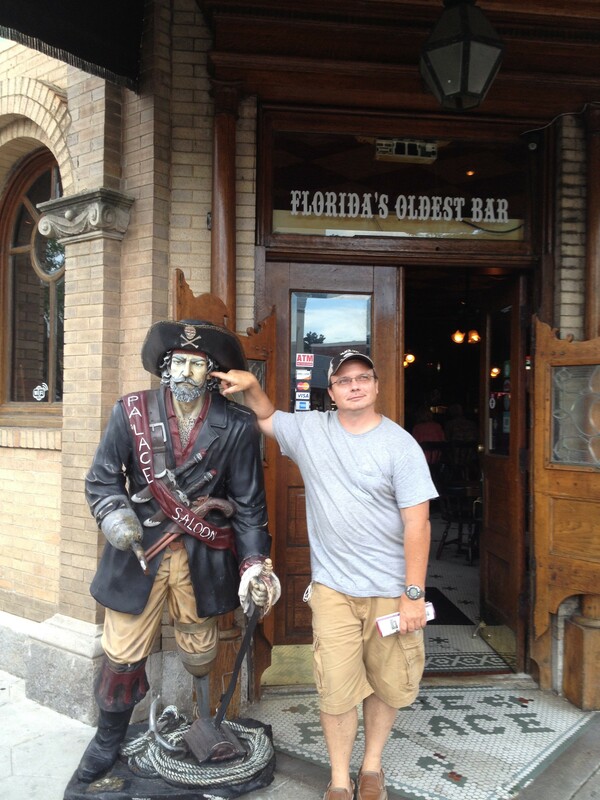 We had to stop in at the Palace Saloon (Florida’s Oldest Bar). The Fernandina/Amelia Island area has a great small small town feel with a lot of original restaurants and also has an amazing hardware store for obtaining parts and small supplies to keep things in good repair. The bonus is that all of these are within walking distance of the marina. Posted on June 17, 2015 Categories UncategorizedLeave a comment on It’s Official…. Day #3 started early-ish as we pushed off from Hammock Beach Marina around 8:00am and continued our passage Northward. It was a pretty quick day since we only had about 20 miles to cover to reach St. Augustine. We had planned to be there early to avoid any Friday evening increase in boat traffic for the Memorial Day Weekend holiday. It was a good thing too, because the powerboat traffic slowly increased all day. Kitty Hawk being “artsy” looking…. 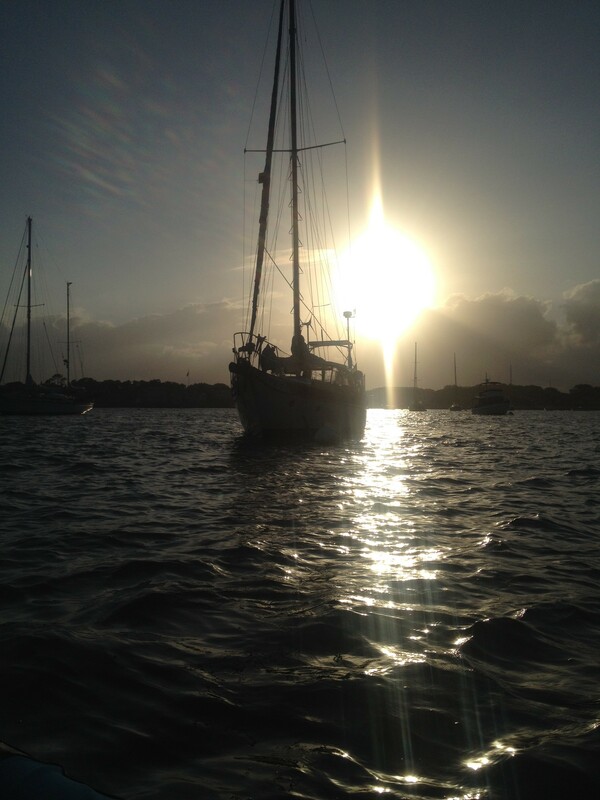 We made it to St. Augustine around noon and got tied off in the mooring field in time for happy hour !! Here’s little advice if you ever go into this mooring field….don’t listen to the harried staff at the office…there are two red markers 10 and 10a…the poor guy on the phone was so frazzled with all the Memorial Day Weekend calls he said to go on the north side of 10A……unfortunately, there was a shoal…we didn’t get stuck at all and probably could have slipped through since it was 5′ but we backed off and went north of 10 and it was all clear….he clearly must have meant “go on the north side of “10”….we did think that advice was a little odd since there were two red markers so close together but we deferred to what we thought was the “local knowledge” at a the time. No harm, no foul though. I feel like I’m not going out on a limb here by saying that St. Augustine is a great town to hang out in for a few days and maybe more. We spent the entire holiday weekend on the mooring ball. We walked the rustic downtown areas, saw some great architecture (and some great bars and restaurants). See our Facebook page for a more detailed accounting of where we visited…. Early on during day #2 we encountered this fellow…Victor Mooney…he recently rowed ACROSS THE ATLANTIC..in an effort to promote AIDS awareness….. 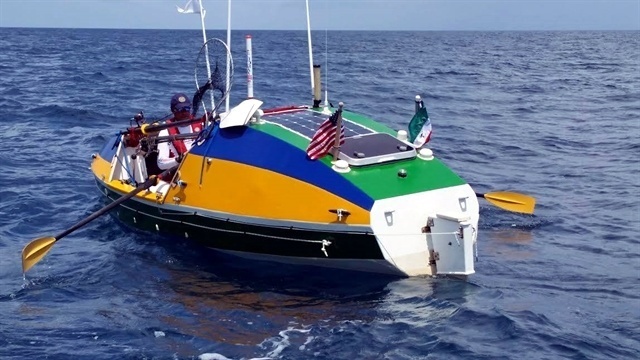 Unfortunately, we didn’t know who he was when we saw him and I later saw a story about him online…Apparently, he had spent the night before near where we were anchored and endured the same storm line we had encountered in this small boat! 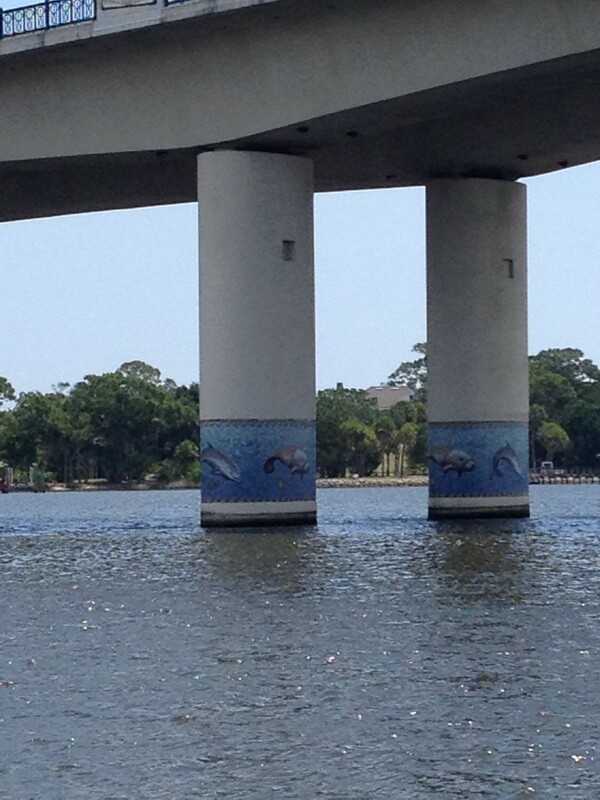 Some cool bridge piling paintings in New Smyrna Beach…. We later passed through Daytona Beach. 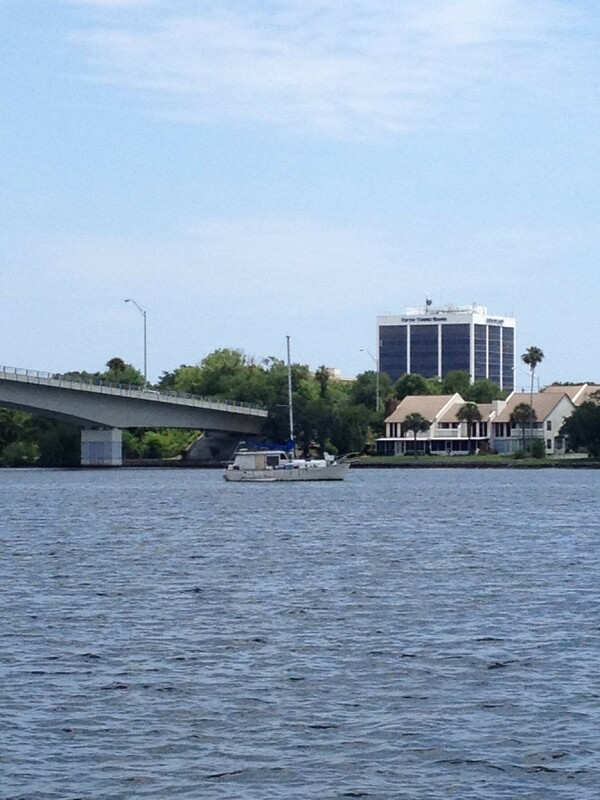 I had a read a lot of bad reviews about the anchorage in Daytona Beach across from Loggerhead Marina. While I do love Loggerhead marina, it has a great pool, hot tub and restaurant/bar, I also enjoy the chance to anchor, dinghy in and save our money for things other than dockage. Many reviews made it sound as if the anchorage was filled with “liveaboards” of the criminal variety, living on derelict hulls, that would board your boat in your absence and steal anything that wasn’t nailed down. As we passed by, I looked for any suspiciously run down vessels. I only saw one boat that wasn’t in good, serviceable condition so I can only hope that the bad elements have been removed or gone elsewhere. Day #2 was pretty uneventful aside from our encounter with Mr. Mooney and we wish him all the best in his trek Northward……..we arrived in Hammock Beach around 5PM where Neil Kaczmarek, the Harbormaster for the Marina at Hammock Beach (386-597-5030 or VHF 16/10 ) welcomed us and took great care of us, getting us a nice quiet slip near the entrance to the basin for an easy getaway in the morning.. our stay included use of the pool, hot tub, TV area, ice machine, showers and restrooms. The facilities were all very nice. They also supplied pool and bath towels, shampoo and liquid soap….cutting down on the items to be carried back and forth…always a nice touch. We got a great deep dish pizza delivered from Mezzaluna Pizzeria (based on Neil’s recommendation) at 101 Palm Harbor Parkway, Palm Coat, FL (386)445-1004…I highly recommend it….I’ve never had a deep dish that lived up to the name as completely as the pizza from this restaurant….This will be a nice place to rent a condo for a few days and get to enjoy the other half of the resort and the surrounding area next time!!! Prior to any departure, we have an informal checklist, (that I would like to convert into an official checklist) of systems that we inspect before departing the dock. 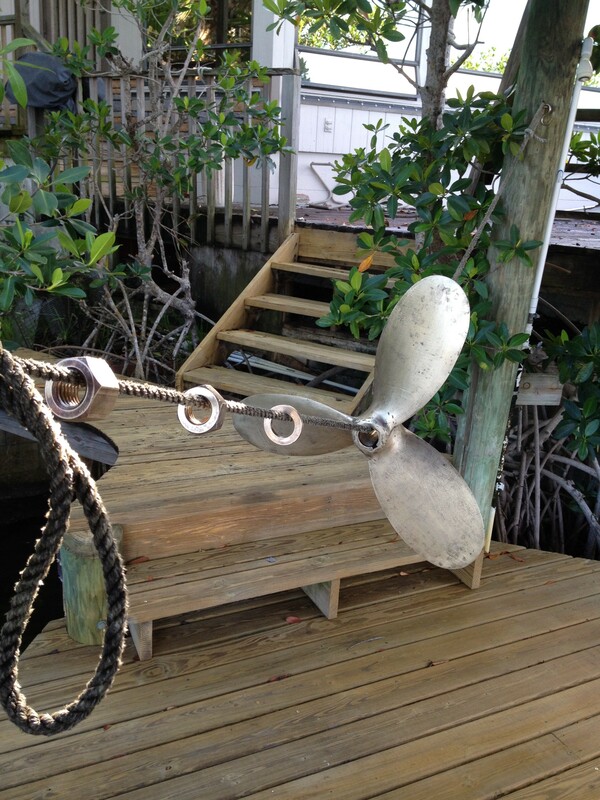 We check the bilge pumps, batteries, engine room, shower sump box, refrigeration/compressors, the dinghy, the outboard, the oil and T-fluid levels, engine belts, the air filter, the raw water intake, all the seacocks, the prop shaft, bearing and the prop among other things. 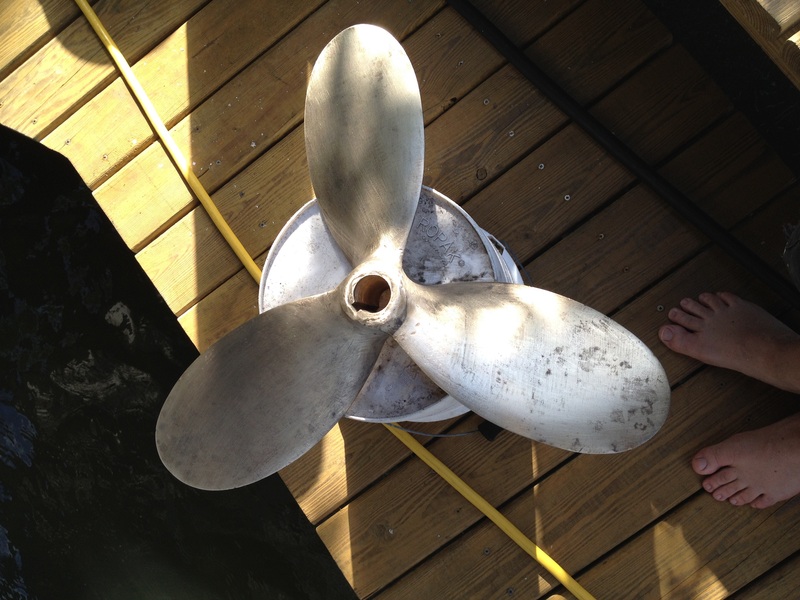 When we left North Carolina in December of 2014, I dove our prop and hull to clean and inspect everything. Aside from a minor wipe down and some minor cleaning of the intakes, everything looked great, the zinc, bottom and prop were clean and ready to go. I have become a big fan of the Petit Ultimate SR-60 bottom paint I applied in December of 2013. After spending six months in the Indian and Banana Rivers in Florida we were preparing to depart Florida when I began our pre-departure checklist of items. Our hull and bottom paint still looked good. Our prop, however, looked like a marine archaeological artifact. I had planned to “bag” the prop with a heavy duty plastic lawn bag but life got in the way and I forgot to do it before we left to return home to help with our ill relative. This was not a condition that we could travel under. 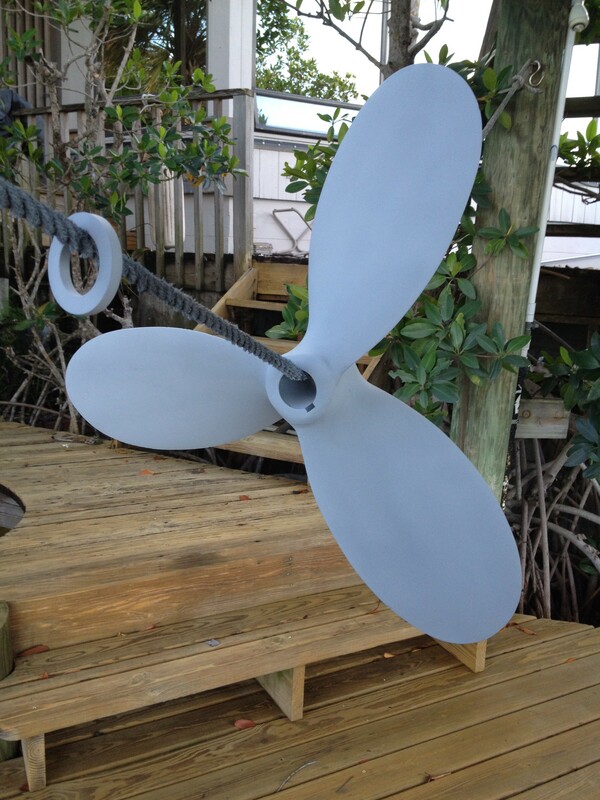 We don’t currently own a prop puller (high on the list of items to acquire) but I was fortunate enough to get a referral to Randall, the owner of Bottoms Up Hull Cleaning in Cocoa Beach (321-458-7323). Randall is a great guy and showed up the next day to pull the prop. I spent that evening cleaning, sanding and painting the prop. 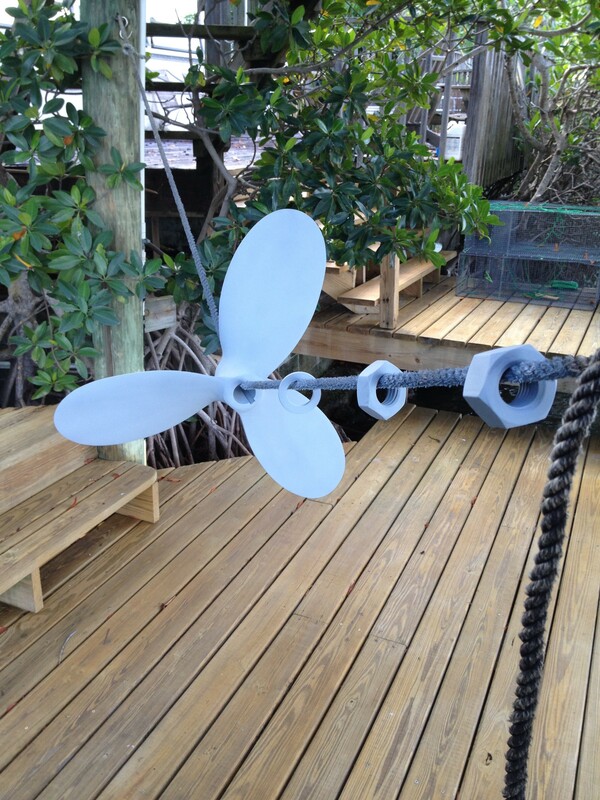 Randall reinstalled the prop, a new cotter pin and a new zinc the following day. He also wiped down the hull and cleaned all the intakes. We had a trouble free passage north and it seemed like our fuel consumption was even lower than normal…..although I haven’t had time to do an official calculation of that yet…..
Posted on June 7, 2015 Categories Experiences, Gear, Maintenance, Our boat, photosLeave a comment on Pre-trip maintenance…. We had initially planned to move Kitty Hawk from Melbourne, Florida to Oriental, NC beginning May 12th in an effort to avoid Memorial Day Weekend traffic. Unfortunately, my associate who had planned to help, received a jury duty summons the week prior which necessitated his appearance on May 18th. So, as sailors do, we altered our plan…. (my friend, who has helped me move Kitty Hawk a few times, always says “sailors plans are written in the sand at low tide” it may not be an original quote…..but it seems to be fitting). We delayed our departure to May 19th which put us traveling in the midst of the Memorial Day Weekend mess. We decided to stay in St. Augustine at the end of day #3 for the entire weekend to avoid the power boat / maniac jet ski rider traffic debacle. Our first day was pleasant enough….a short river cruise from Melbourne, Florida to Just North of Titusville with only two bascule bridges to contend with during the transit….the first bridge was the Addison Point Bridge (Formerly the NASA Causeway Bridge)……this is a twin bascule which means that the individual sides of the road operate independently. It gave us a little worry when we found out that the southeast section wasn’t operational but we easily slipped through the half that was working properly. We anchored in a spot known as “Mosquito Lagoon” a nice, deep (8′), wide open area with no other boats. Ironically, we didn’t see any Mosquitos. We did however see this…..
We were anchored…just north of the marker for haulover canal bridge near where the chart mark for the “ditch” is on the photo of the chart…….we had just gone for a swim to check the anchor which was beautifully and deeply set into the hard mud and crushed shells of the lagoon floor….I felt pretty confident we were in for a good night’s sleep. 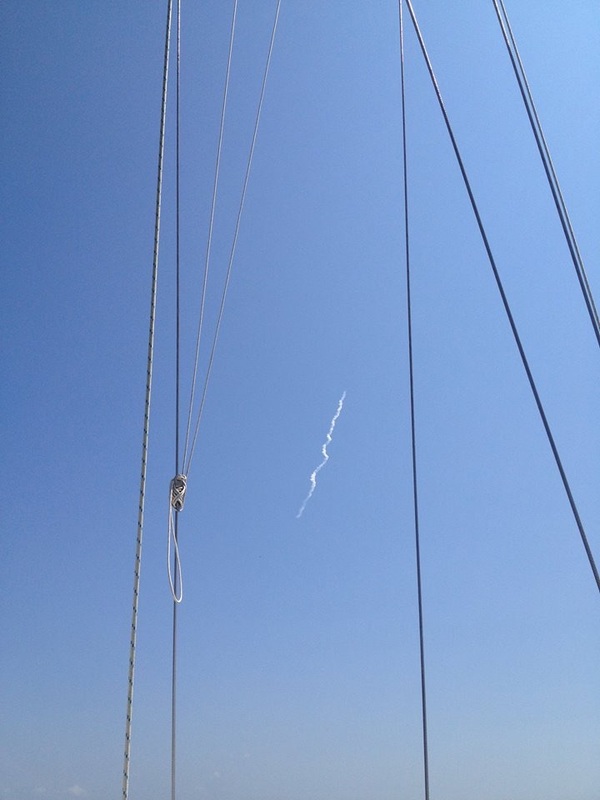 We returned to the cockpit, I checked the weather report and turned the VHF radio on. We immediately heard a weather alert and discovered that an unforecasted pop up thunderstorm with gusts up to 60mph was headed directly for the area in which we had just anchored. The breezes that bracket the Florida peninsula had apparently been battling all day, West of us in central Florida, pushing east and west for supremacy over the weather pattern. In this instance, the East pushing winds won and drove the ensuing storm right at us. We scrambled to secure everything we could, placed our backup electronics in the stove in an attempt to isolate them from any possible lightning strikes. I have read some articles that say a microwave works better since it is designed to keep radiation in and therefore out as well, but we don’t currently have a microwave on board so we went with what we had. We also started the engine and had it in neutral in case we needed to ease the load on the anchor with a little forward thrust. 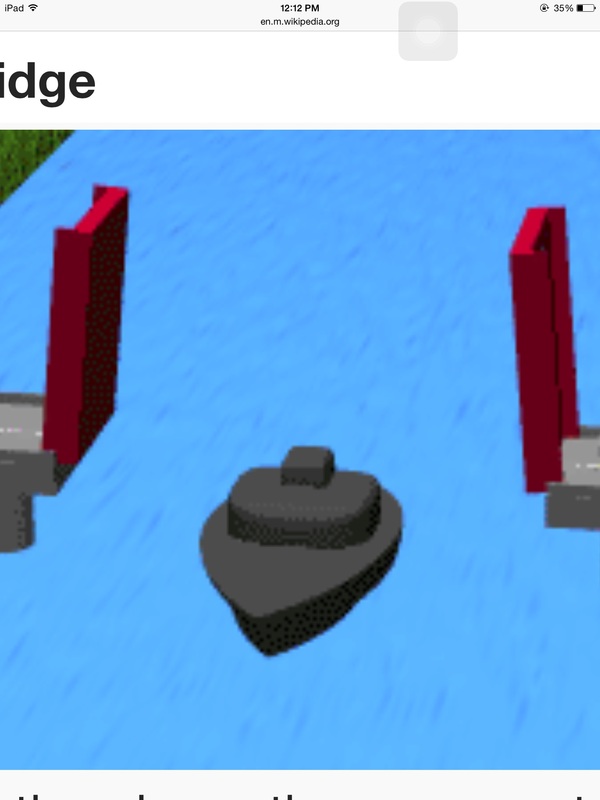 As it turned out, we didn’t need that since the anchor was so well set. 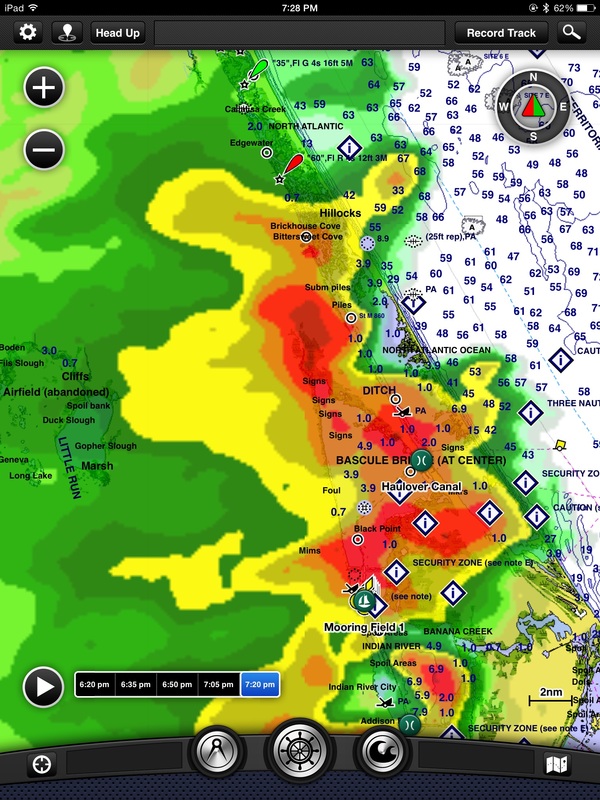 The good news was the wind had died down to about 30mph gusts….the rain was very heavy and all we could see was the amazing number of lightning strikes all around the boat. The weather service report later said that there was an averge of 170 strikes every 10 minutes associated with that cell……it was a stressful 45 minutes until it passed. Kitty Hawk did very, very well. The anchor held perfectly despite several 180 degree turns as the storm passed over us and the wind shifted accordingly. We got a good night’s sleep after all….